YES! I'm obsessed with the new 4-set release that just came out from Crafter's Companion. The collection is called Everyday Sentimentals and this is from the Love is All You Need stamp set. 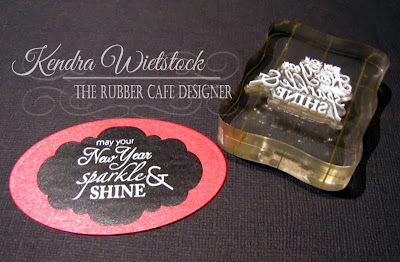 I also used the Floral Frenzy Embossalicious Embossing Folder for the mat. Today I'm sharing more projects using the new Creative Cafe Kit for November called T'was the Night. Since it is that time of year again where we need start thinking about gift wrapping, I thought I'd share some ways that I enjoy adding a little personal touchs to my packages. A quick and easy way to do that is to add a homemade gift tag to your package or gift bag. For my first gift tag, I trimmed my tag from a template and then used Spellbinder dies and the shapes for the sentiment (oval & big scallop oval). I also trimmed a piece of pattern paper 2 1/2" x 2 3/4" for the background of the tag. 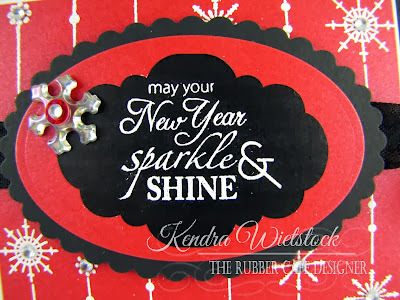 I placed the Splash of Color Chalkboard Label (from the kit) on the red oval & green mat cardstock pieces and then stamped the sentiment from the T'was the Night stamp set on the chalkboard label. Then I added a snowflake embellishment with a red sequin and clear gem. I set it aside to dry while I assembled the rest of the tag. Finished Size: 4 1/4" x 2 3/4"
For the ribbon hanger on the tag, I cut a piece of black seam binding ribbon about 14" long. Then I tied a knot at the end, leaving about 1". I trimmed the ends with my pinking sheers. Then I threaded my knotted ribbon through the whole on the tag from the back and secured the ribbon with adhesive. After that, I attached some jingle bells from the kit using black thread. For my next tag, I used the same tag template on green cardstock and trimmed it with scissors. 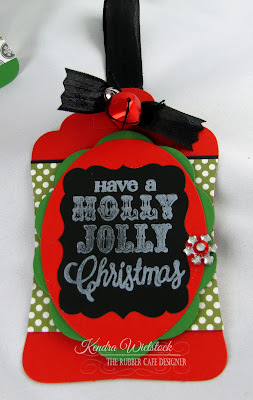 I trimmed the red classic oval with my die cut and added the Chalkboard label and stamped the sentiment in white ink. Then I added a few of the green Goosebump gems from Queen & Co (which also come with the kit). I threaded and knotted the red sheer ribbon at the top of the tag and added the snowflake, sequin and clear gem embellishment. For the background of my tag, I took some scraps of the Echo Park pattern paper and lined them up on my tag. Then I trimmed them with scissors using the tag as a guide where to cut. And here are 3 more tags that were super easy to make using scraps of paper, some ink, punches and ribbon. The possibilities are endless for making beautiful Christmas tags using this kit. ENJOY and don't be afraid to mix things up a bit! 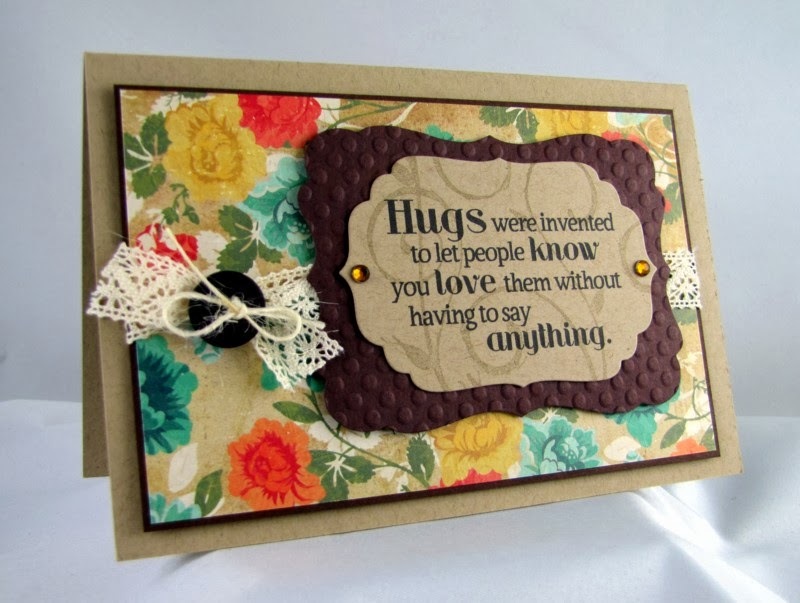 Here's another fabulous sentiment from the new 4-set release that just came out from Crafter's Companion. The collection is called Everyday Sentimentals and this is from the Love is All You Need stamp set. I also used the Best Friend Swirls stamp set for the background on my sentiment and inked that up with Toffee Crunch Memento Ink. Happy Day!!! I'm here today sending you some smiles with a few cute digital images from Hambo Stamps. I used the Cat digi and a sweet sentiment from the Bailey Flower digital set. Misc Button, Twine and Charm. Ahhhh...the pretty summer flowers are gone and the colors of fall have almost completely disappeared from the trees. This gorgeous digital image called Geranium reminds me that Spring will be here again! For my card today, I also participated in the Splitcoast Stampers Free 4 All Challenge this week which is called Have A Heart (F4A196). So I included a heart button on my project. Play Along!!! Hi Friends ~ I'm here today with a new card to share using this adorable little mouse image from Whimsy and Stars Studios. Her name is Lucy Christmas and she is so adorable and puts you right in the mood for Christmas! And the best news...she is available for Instant Download, so you can buy the image and start coloring immediately! The pattern paper is from My Mind's Eye new Christmas collection and I colored sweet Lucy with my Spectrum Noir Markers ~ PP1, PP2, PP4, PP5, DG2, IG1, IG2, IG3, TN4, CT4. Hi There! I'm here today with another Christmas card using the November Creative Cafe Kit called Twas the Night from The Rubber Cafe. * Green card panel - 4 1/8" x 5 3/8"
* Black mat - 3 1/4" x 3 3/4"
* Snowflake pattern paper - 3 1/8" x 3 5/8"
* Red pattern paper - 2" x 5"
* Black mat - 2 1/8" x 5 1/8"
Step 1: I wanted to add some texture to the green card panel, so I used all of the small snowflakes from the Let It Snow Background Add-On stamp set. 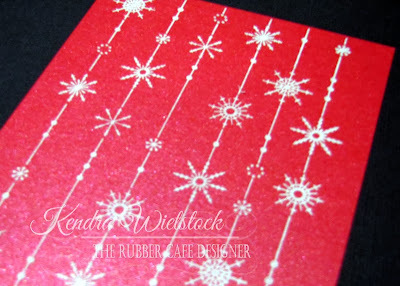 I used a small acrylic stamping block and scattered the snowflakes on the block. Then I used VersaMark ink to stamp a background. Step 2: Once the background was stamped, I attached the green card panel to the black card base. 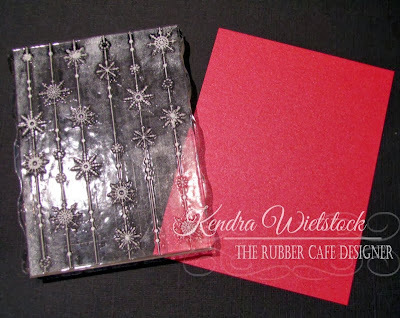 Next, I attached the snowflake pattern paper to the black mat and attached that on top of the green card panel. Step 3: The next step is to make a banner out of the red pattern paper. One of the easiest ways to do this is to take a square punch and line up the bottom edge in a perfect diagonal in the punch and then trim the edge. Then I matted the red pattern paper with a black mat and trimmed the black cardstock. You can trim it with scissors (using the pattern paper as a guide) or the square punch. Then attach the matted banner to the card base. 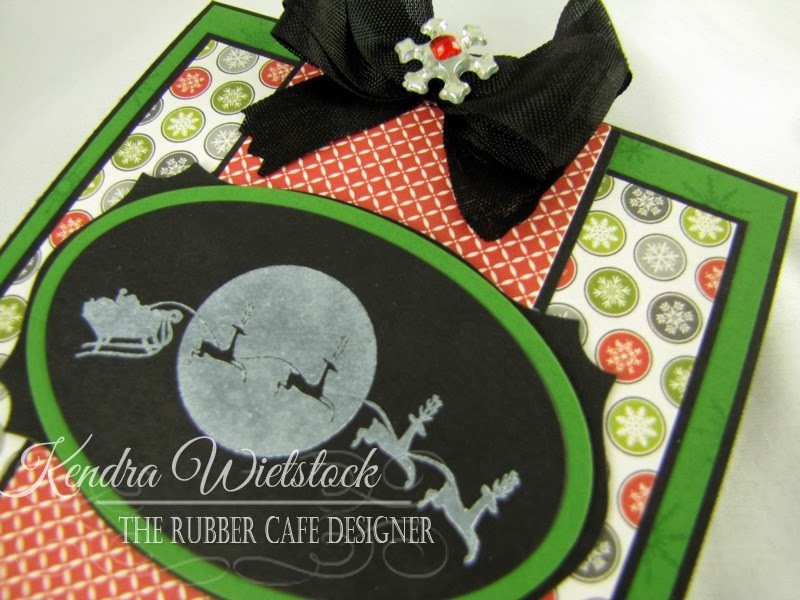 Step 4: Next, I stamped the Santa sleigh image on black cardstock with white pigment ink. This has a great chalkboard look to it. Step 5: A great paper saving tip is to cut your image out a little larger than needed using a decorative edge die. Then using a smaller die, cut the image again (I used an oval). I trimmed a piece of green cardstock with a slightly larger oval die as a mat and then put that on top of my decorative edge die shape. Once they are stacked together, no one has any clue that the shape on the bottom has a big hole in it. VOILÁ! Easy Peasy! Step 6: Attach the stamped image to the card using Kool Tac Foam squares and then add a bow with the black seam binding. I also added a snowflake embellishment with a red square gem (all part of the Creative Cafe Kit). Hoping you have a happy holiday season! Hambo Hoedown Fun ~ Spin It! The new Hambo Hoedown Challenge this week is make an interactive card! This was a challenge for me FOR SURE; however, I managed to make a fun spinner card using the Artist Pig Digital Image from Hambo Stamps. Here's the flip-side of the spinner. The pig is actually meant to be in mud... but I couldn't resist making it paint. The image is a rubber stamp from Hambo called Mud Pig. I used black twine and matted each image back to back on each side of the twine. The image is from the Artist Pig Digital Image. Here's another seriously fabulous sentiment from the new 4-set release coming out this Friday from Crafter's Companion. The collection is called Everyday Sentimentals and this is from the Friends & Family stamp set. Hi Friends! Hope your weekend was great! 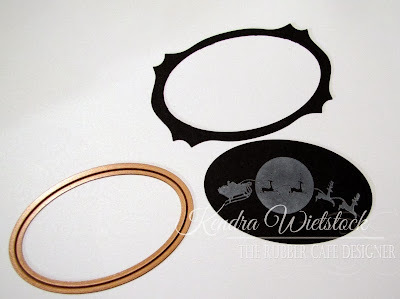 Today I'm excited to share a little sneak peek of a new 4-set release coming out this Friday from Crafter's Companion. The collection is called Everyday Sentimentals and I'm so thrilled with all of the wonderful sentiments in these four sets! Here's how I made my card... 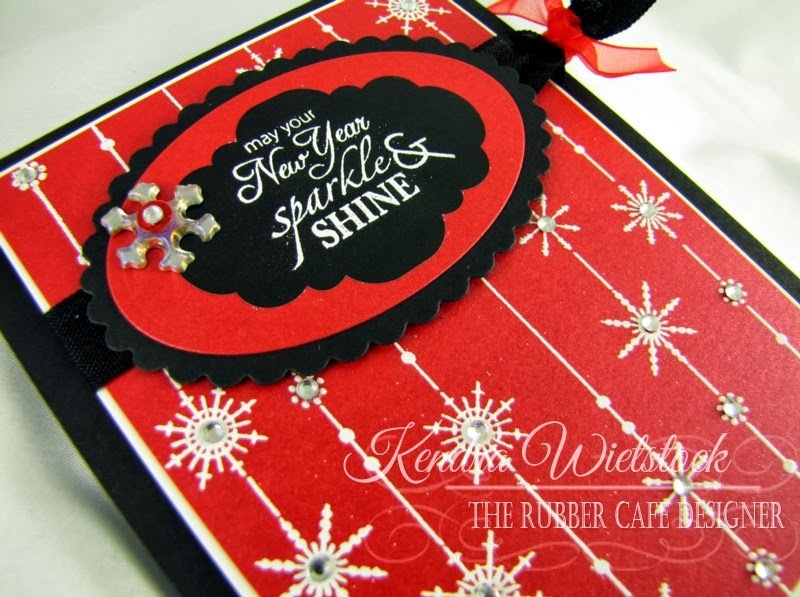 I started with one of the new Darice embossing folders called Large Daisy. I embossed it on Ultra-Smooth white cardstock. Next I colored the dry embossed daisies with my Spectrum Noir Markers ~ LY2, LY3, CG2, EB3, EB6. I started with the LY2 on the daisy petals and then flicked some LY3 from the center toward the outside of each petal. I embossed some brown cardstock with the Petite Dots Embossalicious folder and then added the embossed daisy panel to the card panel and tied a ribbon around it. 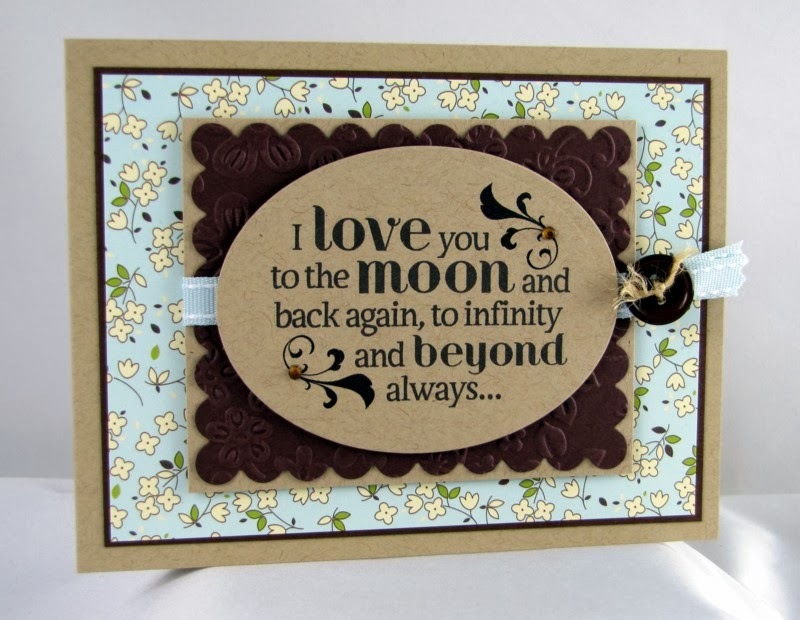 The last step was to add the pretty sentiment from the new Everyday Sentimentals set called Memories are Made. Hi Hambo Friends! I'm here today share this sweet little peep ~ LOVE HIM!!! Today I used the Farm Chicken digital image and the sentiment is one of the rubber stamp images called Favorite Peep. I kept my card Clean & Simple (CAS) because that is the theme of the Hambo Hoedown this week. Come play along with us!!! I colored my cute little chick with my Spectrum Noir pens ~ FS2, FS3, TN2, TN3, TN4, EB3, GB5, GB7, CR7, CR8. CC & Xyron Team Up! Hi Friends... Are snowflakes flying where you live? They have started to fly here in Northern Indiana, but thankfully, they haven't stuck yet... at least not where I am. Today I'm excited to share a fun event that the Crafter's Companion team collaborated with the Xyron team to make some fabulous Holiday cards. For my project today, I used the Stamp-It Australia image called Snowmates and the Let it Snow Embossalicious folder. The image is colored with my Spectrum Noir markers (CR11, OR3, IG8, TN4, EB3). Then to color the snowman and the snow, I took a Q-Tip and inked it with white pigment ink. Then I applied the ink in a circular motion on the kraft cardstock. I attached everything together using the Xyron Mega Runner. WOW ~ what nice adhesive. It is a dot adhesive and is nice and wide (1/2"), so you get great coverage. The actual runner is easy to use and isn't super big. I have small hands, so I don't like those huge dispensers. To secure my button to my card, I used the new Xyron Adhesive Dots ~ these babies really STICK! And they are super easy to use. Make sure you leave lots of love on all of the CC designers blogs (listed to the right), the Crafter's Companion Blog and our CC Facebook page... we'll be giving away a whole bunch of prize packages!!! You have until Monday, November 18th, to leave your comments. Hello Crafty Friends! Today I have a fun Christmas project from the fun November Creative Cafe Kit called Twas The Night from The Rubber Cafe. Today I used the sweet little reindeer from the stamp set that is included in the Cafe Kit. Here's how I made my card: First, I trimmed all of my cardstock & pattern papers (measurements below) & then I assembled the pieces on my card base. 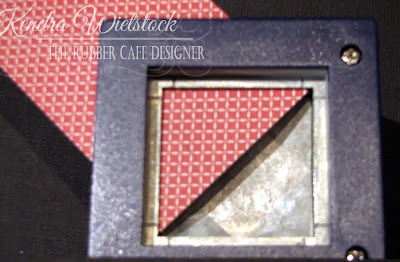 * Black card base - 4 1/4" x 8 1/2"
* Red card panel - 4 1/8" x 4 1/8"
* Red stripe pattern paper - 2" x 4"
* Green pattern paper - 2" x 4"
I also added a red square gem from Queen & Company to each corner of the card (these also come with the kit). For my reindeer image, I decided I wanted to stamp the reindeer in black. However, I really wanted to make his nose and the bow around his neck red. There are a few ways to do this, but my favorite way is shown below ~ it's super easy! First add the image to your clear block. Next, decide which color of ink you are going to stamp with first. I always pick the area that requires the most ink ~ in this case, the parts that will be black. Once that is determined, lightly add some clear scotch tape to the areas of the image that you DON'T want to ink first (the nose and the bow). Once the areas are covered in tape, ink your image with the color of your choice (I used black). Gently remove the tape. Once the tape is removed, carefully add the second color of ink (Love Letter Red) to those areas that were previously taped. I like using the Memento Dew Drop inks because of the pointed end ~ this makes it very easy to apply ink to tight spots. Once you have applied both colors of ink, just stamp the image on white cardstock. Easy Peasy! 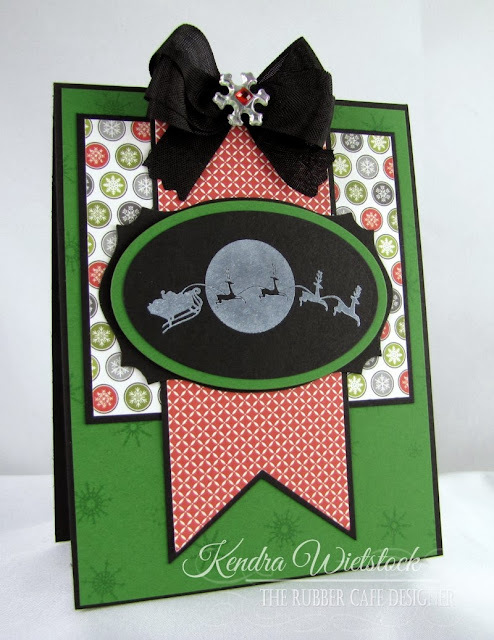 After the reindeer image was stamped, I added the outlined bow in black ink over the top. They aren't exactly the same size, but I like the slightly offset look. I matted the image on a black scallop oval and then popped it up with some Kool Tac Foam to the card base. Since my card is only 4 1/4" tall, I had the top of the matted image go over the top of the card. The total height of the card is about 5", so it will still fit inside a standard invitation size envelope. I also added some clear glitter from my Wink of Stella Clear pen to the nose, eye, and bow ~ just for a little bit of shimmer. Next, I added some of the red sheer ribbon from the Creative Cafe Kit along with a snowflake embellishment, a green sequin and a clear gem on top of the knotted ribbon. For the final touch for my card was a sentiment. As I was looking at the fabulous Echo Park pattern papers included in the kit, I noticed this particular pattern had some fun sentiments printed on it. So I took out my oval punch and lined it up so the "Christmas Joy" was showing in the exact spot & then punched it out and added it to the bottom of my card. Now wasn't that easy? Hope you enjoyed my tutorial today! 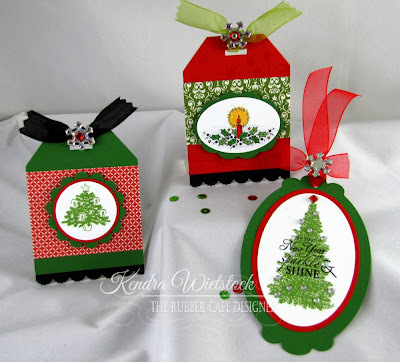 Today I'm sharing a pretty new collection from Sheena Douglass from Crafter's Companion. It's a gorgeous two set collection in the A Little Bit Scenic Range called Seascapes. This Seashell set is so pretty and I just couldn't resist paper piecing them with the Island Sun collection by The Paper Loft. I used the Petite Dots Embossalicious folder for my background. Then after cutting out my seashells, I added a touch of additional color using my Spectrum Noir Markers (GB7 & TB3). The final touch, my knotted rope, was from a tutorial I found online on macrame knots. I love how it turned out. Whimsy & Stars Studios New Release! 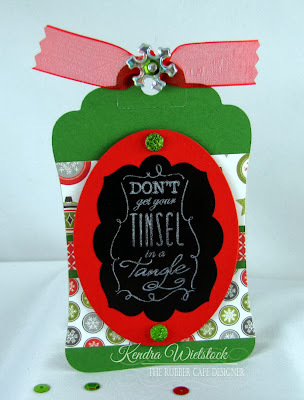 Today, Whimsy & Stars Studios has a fun new release for the holiday season! The new image is called Christmas Snowman he is ADORABLE! In addition, there are a two new sentiments being released called Christmas Wishes ~ Merry Christmas & Let It Snow are the sentiment included. For my project today, the designers were challenged to make tags & I decided to use some unconventional Christmas colors and make the snowman PINK. I think it turned out super sweet. The pattern papers are from My Mind's Eye (a collection I found at Hobby Lobby) and the ribbons and trims are from Stampin' Up!. I colored my image with my Spectrum Noir Markers ~ PP2, PP3, PP4, PP5, CR1, OR2, IG1, IG3, IG4, IG6, BT1, BT9, DG2. And below you can see where I added glitter & white flock to the colored image. Super sweet little guy huh? Check out what the other designers made with the Christmas Snowman ~ check out the Whimsy & Stars Studios Blog! I stamped a bunch this weekend and pulled out an older set called Dreamy Daisies by Crafter's Companion and the sentiment is from the Sentiment Swirls set. These are a few of my Go To sets that I have in my stamp collection. The pattern paper and ribbon were from my stash and I have no idea the manufacturer...sorry about that! Just trying to use up odds and ends... and boy oh boy, do I have LOTS of odds and ends. Today I have another Clean & Simple Christmas card to share. I used another new Stamp-It Australia sets from Crafter's Companion called Believe to make this cards. I love the slightly vintage feel of these sets and they make for super quick cards. This card is also for the Crafter's Companion Challenge this month! The theme is Christmas or Winter and we would love it if you played along. When getting ready for the holidays, we all need to simplify and this card is just the ticket! I used one of the new Stamp-It Australia sets from Crafter's Companion called Joy & Spirit to make this cards. I love the vintage feel of these sets and they make for super quick cards. Sparkle & Shine with the new Creative Cafe Kit! Are you ready for some Sparkly Fun? I'm here today to share my first project from the brand new Creative Cafe Kit for November called Twas the Night. When I saw the add-on background stamp in the kit called Let It Snow Background, it was the first image I grabbed! The kit also comes with some very pretty sparkly red Bazzill cardstock that is GORGEOUS!!! I inked my image with white pigment ink and then stamped it on a 4" x 5 1/4" piece of cardstock. 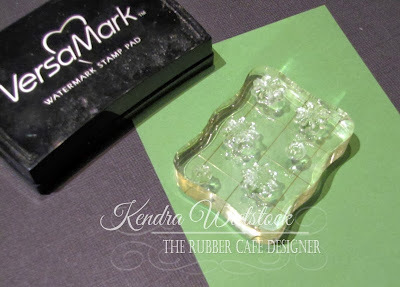 Then I used white embossing powder and heat embossed the stamp image. 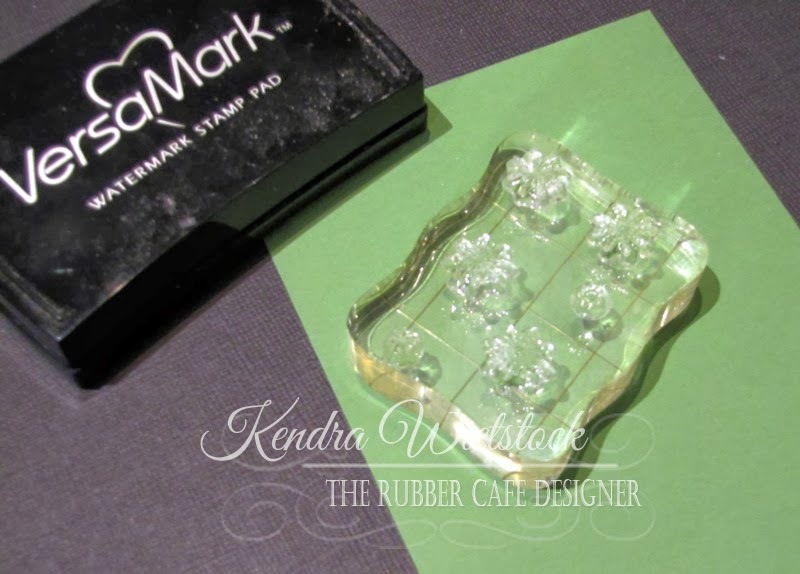 TIP #1: When stamping in white ink, you will get a much brighter white image if you use white embossing powder rather than clear powder. Once the image was heat embossed, I trimmed my card panel to measure 3 3/4" x 5" and matted it on a piece of white cardstock. TIP #2: If you trim the stamped card panel after you stamp the image, you can correct any crooked images when you cut it with your paper trimmer. 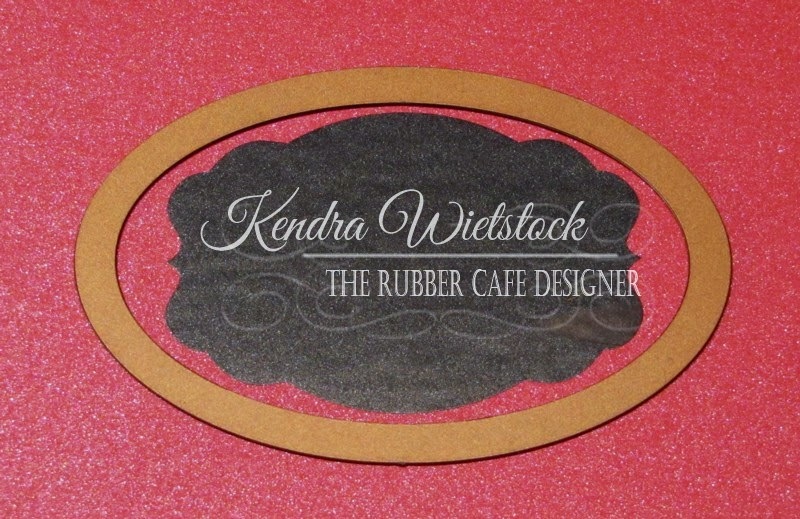 Next I used one of the Splash of Color Chalkboard Labels that comes with the kit and attached it to a piece of the red sparkly cardstock. Then I trimmed it with an oval die cut. 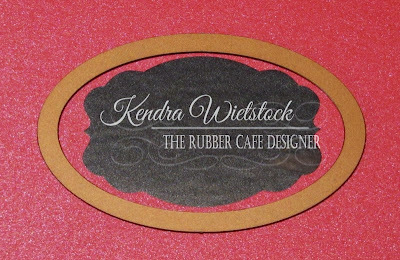 TIP #3: When you use open die cuts, it's a good idea to stamp your image first (or in this case, add the Chalkboard Label). This way you can make sure it is lined up correctly. Next, I stamped my sentiment (from the other add-on set called Tangled Tinsel) with white pigment ink on the black Chalkboard Label and then trimmed a black scallop mat to add to my sentiment. I then heat embossed the sentiment with white embossing powder. TIP #4: Be very careful not to heat up your label too much with your heat gun or it will start to bubble. (Yes, I learned the hard way ~ notice the label in my first picture is different...just sayin'). After adding some of the black seam binding & a bit of sheer red ribbon to my card, I attached my sentiment to the card panel with Kool Tac Foam Dots. My last few touches for my card ~ I added a clear snowflake embellishment to the sentiment along with a sequin and a clear gem stacked together (all included in the kit). And... I added a small clear gem to the center of each snowflake on the background. Those little touches all added lots of shimmer to my card! 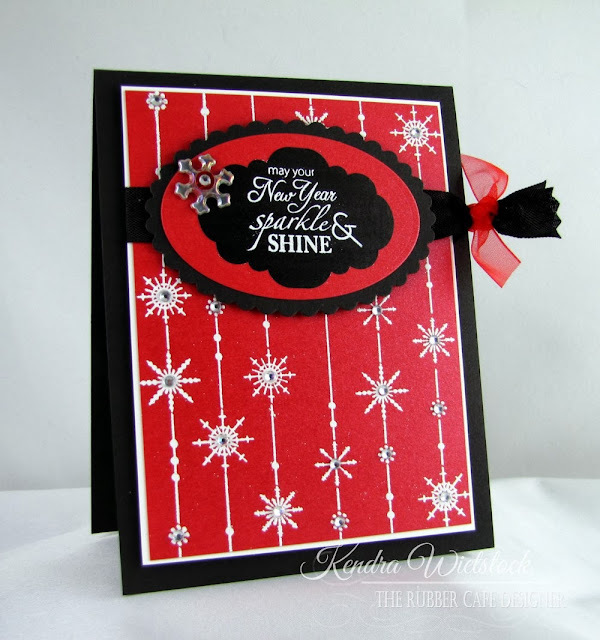 I hope you've enjoyed my little tutorial on and tips for my sparkly card today ~ I know you'll love this kit as much as I do! Whimsy & Stars Studios ~ So Thankful!